Christmas day rarely ever snows.. it either snows a lot before or after the day, but never on the actual day! So here's hoping for a white Christmas! I painted my index and pinky fingers with three coats of Beyond the Nail - White Microglitter. On my middle & ring fingers I painted them with two coats of Beyond the Nail - Sloteazzy. 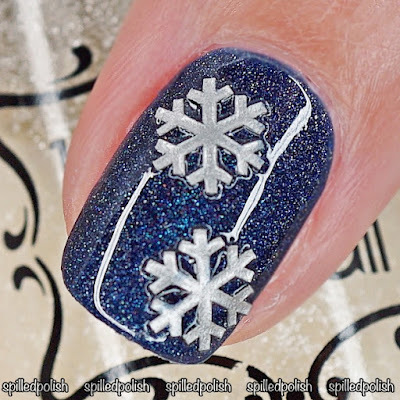 When everything was dry, I added two Snowflake Nail Decals on my middle finger and topped everything off with PRO-FX - Quick Dry Topcoat.